Fans of Flemish cycling may have their rampant black lion, but the new High Peak Hog sportive has been given its own iconic animal – a beastly-looking black pig rearing up on its hind legs. Wild hogs no longer roam this area, but the theme comes from the welcoming hog roast, which fed the 200 hungry riders back at the ride headquarters of Glossop Cricket Club. 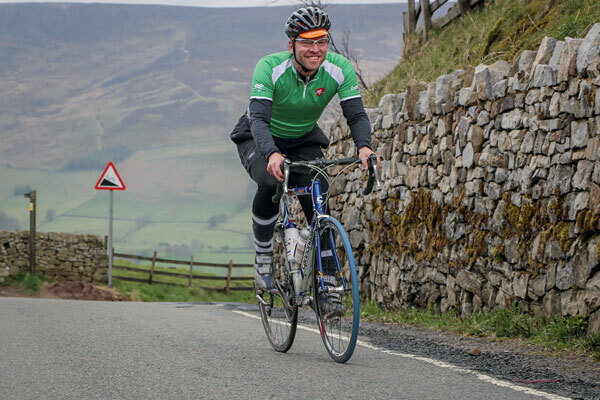 Served up by the enthusiastic Glossop Kinder Velo Club the 83-mile Whole Hog route should certainly be considered a beast, packing in as it does nine major climbs totalling over 9,000 feet of climbing and all branded with a ‘hog rating’ for severity. For those looking for a shorter day in the hills, the Half Hog weighed in at around 50 miles and still took in the famous climbs of Snake Pass and Holme Moss to traverse first east and then west across the Pennine range. 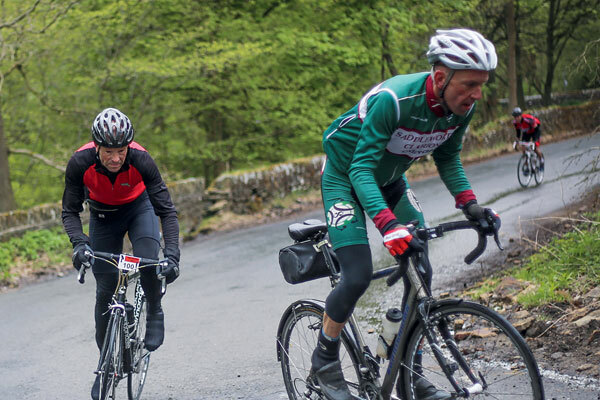 Held on the same day as the established (and oversubscribed) Fred Whitton Challenge, the Hog offers up a menu of famed Pennine and Peak District climbs and could easily become a classic itself. It was organised and executed so well that it came as a shock to read (at the end of the comprehensive rider’s manual) that this was the club’s first ever sportive. Jackets were on as we rolled out early doors through the historic heart of the market town of Glossop, which lies 15 miles east of Manchester and sits at the foot of the day’s first big climb – Snake Pass. Familiar to many people from UK traffic reports, the A57 Snake Pass is frequently affected by winter snow falls and is often the first trans-Pennine route to close to traffic in such circumstances. From the Glossop side, the Snake is a four-mile climb, but with a steady gradient, averaging seven per cent, and a smooth surface we were soon into a good rhythm and warming up nicely. The steep hillsides that surround the climb of the Snake are a dramatic and immense patchwork of purple, brown and green heather, and the result of careful moorland management not only to preserve the landscape but also to provide the right habitat for grouse for the shooting season. Both Hog routes are contained almost entirely within the boundaries of the Peak District National Park, which was one of the first areas to be given such designated status in 1951. Once over the summit, the fast descent plunged us into the narrow valley, which with forest plantations clinging to its sides bore a striking resemblance to the landscape of the Belgian Ardennes (where wild boar can still be found). Before long we were pushing along the side of Ladybower Reservoir, where the two Hog routes diverged. With the wind behind us and the sun making an occasional appearance, we sensed that a pleasant day was in store. The Whole Hog route turned south at Ladybower into the heart of the Peak – a 33-mile loop that, despite taking riders through a more picture-postcard section of the area, also threw in three tough ‘hog-rated’ climbs. With the first two hours nearly behind us and the temperature refusing to rise, this was where the welcome free breakfast of hot porridge supplied at the start was going to start powering the legs and soul. The Pennine Way footpath starts its journey to Scotland in the remote and idyllic Edale, and the Hog takes the other route out from the valley head – the twisting ascent to Mam Nick, which is rightly awarded the highest climb rating of ‘five hogs’. Above the climb is Mam Tor – known as the ‘shivering mountain’ because of its collapsing south eastern flank, the movement of which finally led to the abandonment of the A625 road in 1979. After the dramatic and bumpy descent of Winnat’s Pass, we reached Castleton and entered the more pastoral limestone scenery of the White Peak (the northern gritstone area being known as the Dark Peak) before heading north again via Stanage Edge to rejoin the Half Hog route. The weather, unfortunately, failed to improve, and it stayed grey and blowy, with rain already falling as the first of the Half Hog finishers started to arrive home. The event attracted a wide cross-section of riders and, with the terrain in this region always challenging and the strong westerly making homeward progress heavy work, all those who got around (many were put off by the poor forecast) could feel a shared sense of victory against the elements and the inclines. 10 per cent gradient, 100 per cent happy! The route travelled two sections of road that will be included in the second stage of next year’s Tour de France, which should build the event’s popularity. The Glossop club used the Hog to share their demanding training ground and largely as a means to showcase their friendly club to potential new recruits rather than provide a large commercially orientated event, though. This makes for a refreshing change from the bigger sportives. The Strines is revered by many Yorkshire riders and is a moorland road rudely interrupted by a series of three steep-sided valleys, which ridden in this south-north direction become successively steeper. The sharp corners are narrow and the road surface poor, which is why the Tour will only ride south through the first valley before heading off towards the finish in Sheffield. 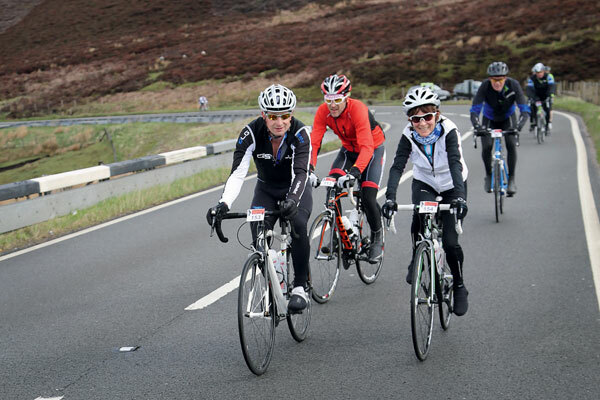 The third Strines climb of Ewden Bank rears up to over 20 per cent and had some riders taking a breather or pushing. Riders began to get a real buffeting from the wind and rain after the Strines, as the route turned westward before dropping down sharply into the Holme Valley near the Holme Silver Band hall. All was quiet in the band room, although there is a good chance that they will be playing when the tour peloton passes through. We began the tough, three-mile ascent of Holme Moss with the knowledge that we were passing through ahead of the world’s largest cycle race, but that today the ‘five hog’ climb was our battleground. “Kinder Velo delivered a real classic at the first attempt with this one. It could be billed as Fred Whitton’s little brother, staged on the same day, just for sibling rivalry! The Glossop club showed off their challenging backyard with proper ambition, logistical nous and a quirky ‘by cyclists for cyclists’ sense of humour to maximum effect. 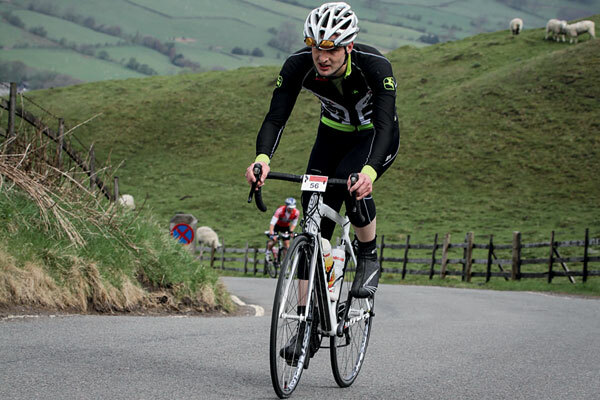 “I chose the Half Hog as it was the right distance for me at this time of year and because it contained two classic climbs: Snake Pass and Holme Moss. The hog roast was a nice touch and beats a protein shake any day. The organisation was great, too. “The High Peak Hog was a fantastic ride. As a lone entrant the welcoming nature of the entire team was such a bonus and, with the poor weather, our safety and well-being were well looked after. This article was first published in the May 30 issue of Cycling Weekly. Read Cycling Weekly magazine on the day of release where ever you are in the world International digital edition, UK digital edition. And if you like us, rate us!